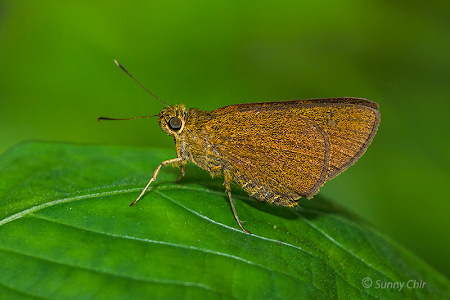 A curious name for a skipper that is usually encountered sitting still and doing very little except perched with its wings folded upright. Pugnacious means having a quarrelsome or combative nature. I wonder under what situation the author of this skipper came across when he first encountered this species! The Pugnacious Lancer is rarely seen, and even much less photographed in Singapore. It is usually a solitary individual that is encountered, perched at low shrubbery along the forest fringes. The Pugnacious Lancer is predominantly brown on the underside, with a generous ochreous scaling on both wings. The characteristic 'twin spot' at the post-discal area of the forewing above easily distinguishes this species from the many brown lookalikes in the Hesperiidae family. On the underside, the two small black apical spots adjacent to the yellow hyaline spot is also a distinguishing characteristic of this skipper. This shot was taken last weekend by ButterflyCircle member Sunny Chir.